Obtaining SBA/VA Certifications as well as GWAC and IDIQ contracts are key building blocks for obtaining federal contracts. A beginner firm sits back and waits for contracts to come to them. A novice firm seeking to become an expert firm engages in the following activities in order to control their own Federal Business Development path. GSA Schedule Optimization Having a GSA Schedule places your goods and services on GSA Advantage. If you want your products to appear first when searched for by Federal Buyers, your schedule needs to be optimized for search results. 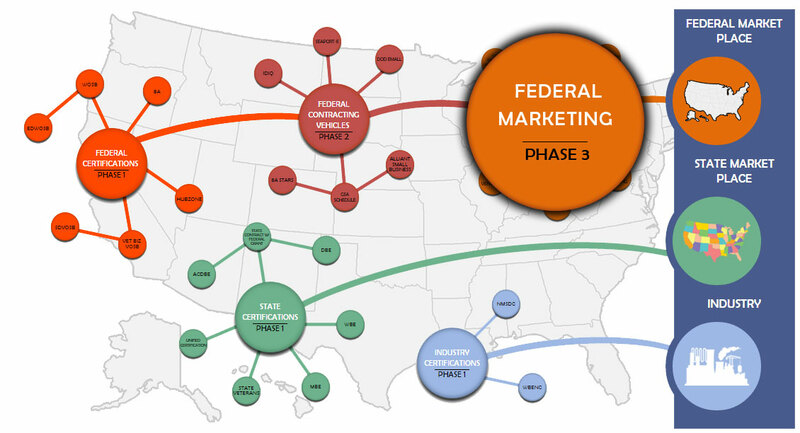 This is done by matching your Federal Buyers typical search methodology while also making key modifications. Subcontracting Registration The federal government requires that for all contracts (generally the threshold is over $650,000) a small business inclusiveness plan be developed that provides approximately 35% of the contract to small businesses. Registering as a vendor with large businesses allows your firm to have access to these subcontracting opportunities. Joint Ventures Firms with certain certifications are permitted to join with other businesses to bid on federal contracts. Sometimes these are separate legal entities and sometimes they are based upon a binding contract. Joint Ventures can be an excellent bridge for new firms entering the federal contracting arena. Federal List Building The creation of a list that not only targets federal procurement officers who have bought your good or service in the past two years, but also those officers that your ez8a analyst deems to show good potential based on your firm’s capabilities. Nurturing relationships with those procurement officers is critical to helping insure your firm wins the next, big opportunity. Training Training your business development individual or team provides your firm all the skills necessary to be successful in selling to the many federal agencies.